It has videos of famous actors reading fun books. 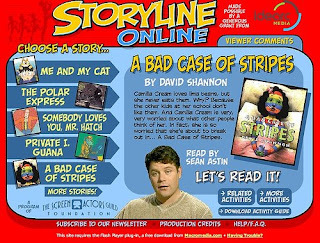 My daughter loves it and keeps requesting the "stripe story" featured above. She just watched it a minute ago so I could go put the baby down for a nap. Go check it out. Got a site to recommend (for the kids or the moms)? My first post on this blog was about what to do in the summer. I talked about fun and free places to take your kids. One reader however brought up a good point: What if you can't go places and have to entertain your kids at home? If you're a one car family and it's too hot outside to go anywhere, the day's can get long and mundane. Her situation can be particularly boring at times because she only has one child (no playmates but mom). I know, I've been there. We have one car and my husband's work is about 45 minutes away, so not like I can just drive him there. So what do you do to keep your sanity when you're caged up? Okay, so this isn't really about women who are carrying toddlers in their bellies, but it feels that way sometimes so I left the title. I'm talking about carrying two babies, one on the hip and one in the belly. I remember being pregnant with my daughter and loving pregnancy! Felt great, got rest, didn't get too big, ate when I needed to, didn't push myself (much), and didn't feel any contractions until an hour after my water broke. Then comes the second pregnancy and you've got this toddler in addition to the baby you're growing and pregnancy is a whole new story. You know, what I'm talking about, most of you are there right now or have been recently. So how do you balance the needs of your toddler and those of your unborn child? Toddlers need to be held, hugged, changed, carried and sometimes dragged just as much but as a big pregnant lady it's exhausting and strenuous. Tantrums become an especially difficult challenge during this time too. Not so easy to pick them up and take them away. So short of sending your toddler to live with Grandma for 9 months, what can you do to take care of your babies and yourself? Well, I'll mention a few things I did but I really want to hear your thoughts because God has a kind way of making you forget your pregnancy and labor trials. 1. Stay Home- This may sound like a joke but for me it's serious. I didn't go out more than I needed to. For my second and third pregnancies we were living in a second-story condo so trying to get my tired, pregnant self and 1-2 kids to and from the car was tiring enough just to think about. I spent time at home getting things ready for baby and getting in my last one-on-one time with my current baby. Then if there was a tantrum I could just walk out of the room and not be publicly embarrassed. 2. Preventative Measures- I'm all about planning and preparing in advance (see my "Saturday.." post). If you are going out bring what you anticipate you and your toddler needing-snacks (for both of you), sippy cup, toy, diapers, anything to lower the risk of stress and fits. Don't go during nap times or other cranky times. Know what type of things upset your toddler and avoid when possible. 3. Take it Slow- Toddlers move (and pregnant ladies for that matter) at their own pace and don't like to be rushed. Schedule yourself accordingly. Don't pack your schedule, it'll wear you and your toddler out. 4. Structue/Routine- Don't pack your schedule but do have one, and make it routine. Toddlers need structure and routine. Naps should be about the same time and length every day and bed time routine the same. Okay, so you don't have to pencil in coloring time , but the things that are done daily need to be the same. This will help relieve stress for both of you and help a ton when baby comes. 5. Don't give into Tantrums- I once heard that you don't need to explain your children to anyone-anyone that has children already understands, and anyone who doesn't won't understand. If your kid throws a tantrum they're looking for attention (even negative). You can wait or just walk away if necessary (okay don't leave them in a store but you can peek around the corner from the next aisle). 6. Hire Daddy- I use to wait until my husband got home to do my shopping (or sent him). My child got Daddy time and I got quiet time at the store. Sometimes I'd wait until after their bedtime so I didn't feel bad for my husband. 7. Lots of Love- In addition to gearing them up for baby, show your toddler how much they mean to you and will always mean to you. This is a rough time for them too and they need lots of hugs, kisses, and time from you. Find things you can do with them that you think you'll still be able to do with them when baby comes. Stories are a great way to spend toddler time while nursing. Well, you probably knew all that already, so what has helped you during the pregnant/toddler stage? Parents magazine "Best Children's Books by Age"
Got a book (or list) to recommend? Leave a comment and share the joy of reading! This post was submitted (at my request) by my friend Megan. She has two kids and her husband's a teacher so they are pros at budgeting and value shopping. If you want to learn more ask through the comments or I can forward her through my e-mail. Thanks Megan! I like to think that I have three jobs. I'm a stay-at-home mom; I teach voice lessons two to three hours a day and third I buy healthy food for my family at DIRT CHEAP prices. I cringe when the person in front of me at the grocery check-out pays twice as much for their small pile of groceries than I do for my over-stuffed cart. Just the other day a lady was in front of me who paid around $200.00 for a cart that was about ¾ full of food. I only paid $125.00 for my two over-stuffed carts (my husband was there to help push the second). My third job makes me feel like I am saving my family tons of money (which makes my husband and I very happy), but it is a job and it does take time and if you are willing to sacrifice a little to save a lot then here are my suggestions for getting started. 1. Create a monthly grocery budget and don't go over it!! My husband and I buy all of our groceries, diapers, house supplies, and food storage on a budget of $150.00 every two weeks. To stay true to your budget write down all the prices of what you put into your cart as you are shopping. Then add up your total BEFORE you get to the register. It never fails if I am lazy and don't add up my total before I purchase my groceries then I almost always go over. 2. Create a menu for the days you will be shopping. I go shopping every two weeks so I plan for two weeks of Dinners, Lunches, Breakfasts and Snacks. I then post the menu up on the fridge so if my family wants a snack or to fix their own breakfast they know what is available to them. 3. PRICE MATCHING!!! This is a HUGE key for saving money. I could probably write a whole blog just on price matching and how it works so I will be as brief as possible in this section. I have not bought any of my meats, cheeses or fruits full-price for over a year now because I live by this principle. Every week the local grocery ads magically show up in your mail box. DO NOT THROW THEM AWAY! THEY ARE YOUR NEW FRIENDS! a. Look through them and make a list of the sales that fit your needs. 4. Look out for HUGE SALES! If you live in Utah or Nevada around every General Conference Smith's has Case Lot sales that are perfect for buying canned goods for your food storage at extremely low prices. Some stores will have 8 hour sales that are to die for as well. 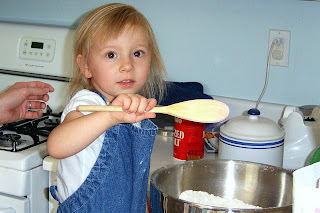 Check out selfreliantsisters.blogspot.com for more ideas on saving money at the grocery store or elsewhere. If you have any other questions you can leave a comment or have an e-mail forwarded through realmomsrule@gmail.com. 1. Buy large jars of no sugar added applesauce (not baby food jars). Great for breakfast mixed with baby oatmeal or other homemade foods. My older kids like applesauce too so we keep this stocked. 2. My wonderful mother-in-law bought me a food processor one Christmas. A gift I never knew I needed but LOVE! Not only does it help make meals quickly but I use it all the time for making baby food. I buy the plastic, stackable baby food containers (Parents Choice-Walmart now has some) and then wash them after they've been used. Throw some canned veggies (no sugar or salt added) into the food processor and fill up 3-4 containers and refrigerate. I also buy the large bags of baby carrots at Sam's Club (Costco), great snacks for the rest of us. I cook some, throw them in the food processor with some applesauce (for taste and texture) and he loves it. 3. Mash ripe bananas with water. Good way to get baby use to texture. Mix in some rice cereal or oatmeal to thicken. 4. Munchkin brand sells a "fresh food feeder" with a mesh pocket to allow babies to eat whole foods on their own. It can be a pain to wash but when you're desperate for hands-free time and your baby's craving independent feeding, it can be a life-saver. When my baby's crying for food and I'm trying to make dinner I toss him in the highchair with this contraption. Bananas are easy (killer clean-up though). I also like baking a sweet potato and cutting off chunks to throw in the feeder (if you bake instead of boil, the skin peels right off). 5. Make your own Zwieback Toast by toasting bread until crispy and slicing into strips. When my daughter refuses her crust, I just hand it to the baby (as long as it doesn't have honey, pb, or strawberries on it). 6. Cut fruit, cooked veggies, and hard cheese into tiny pieces for baby to self-feed. My 9-month-old wants real food now and has little patience for the spoon anymore, so this is how we compromise right now, while he eats his tidbits I sneak bites of baby food in (when he opens his mouth for his fistful I stick the spoon in). 7. If I'm trying to get baby to eat a food he doesn't care for (or something new) I give it to him with something I know he loves. So if he has pured turkey I'll serve it with peaches. I alternate bites so he keeps his mouth open in hopes for the peaches. Or I scoop up a little turkey then peaches in the front of the spoon. What's your baby-feeding secrets? Got a favorite "recipe" or trick? 1. Line measuring cups with saran wrap before filling with peanut butter or shortening- I hate the impossible to clean mess that these foods leave behind and was so excited to find this tip! 3. Cut up raw chicken into cubes and cook, then seal in baggies and freeze (I have a food sealer that is great). This way you'll have cooked chicken ready for quick recipes. 4. Cook ground beef, spread on cookie sheet and freeze. When frozen, remove the beef from sheet and store in bags. 5. Double the recipe when you make cookies and freeze the extras (individually) on cookie sheet, then store in bags. Then you can have warm cookies another day without the dirty bowls to wash (great for last minute visiting teaching). Note: Adjust the oven temp. and time when cooking frozen cookies. Crosshatch pb cookies before freezing. 7. Wash Gerber 'lil Entree bowls and reuse for toddlers- normally my cheap self wouldn't pay for a namebrand product I can make myself but the plastic bowls have 2 compartments and are great for adding a side to meals. 8. Bibs with sleeves and ties- my toddler (like most) is a mess and pulls off velcro bibs. So I bought him one with sleeves and a tie so his whole shirt is covered and he leaves it on. 9. Those thin plastic cutting boards also work great as placemats for messy children and clean up easily. 10. Use a pizza cutter to cut bite-size pieces of anything (like waffles, pancakes, and noodles). So much faster. 11. Keep your plastic cups, bowls, and plates in a bottom cabinet so your kids can get their own stuff and help set the table. 13. After getting home from the store, wash and cut up celery and store in tupperware or bags for easy snacking. I also wash my grapes and pull them from the vine to store. What tricks do you use to make your kitchen more effective and simplify your meals? Share your thoughts by leaving a comment.